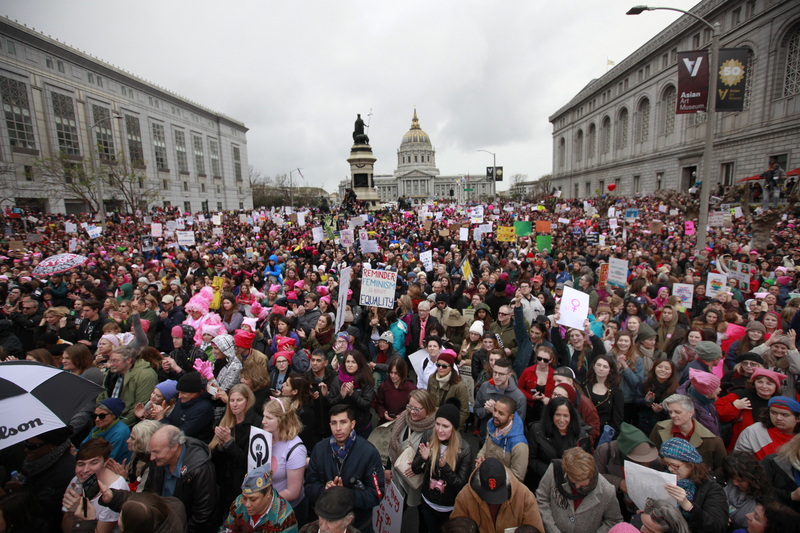 After the shudder and wretch inducing inauguration, the incredibly successful Women’s March on Saturday was balm for a lot of our souls. A reminder that Trump does not have the support of the American people. Which is all well and fine, but what good does protesting actually do? Especially when the aims of the protest are so nebulous and ill defined? Even if we have the numbers, the bad guys have the power. Does all this marching and protesting actually matter? Are we just yelling to the wind as some critics have charged? Well, I would argue that protests – especially large, noisy, hard to ignore protests do matter and will make a difference. And this is true even when there’s no specific policy goal or demands being made. Heck, the Republicans have spent the last 8 years (or longer) demonstrating that protest works, even when no one actually agrees with what you are trying to do. The reason that protests work and are worthwhile has to do with the way that most people think about politics and the political process. Which is to say that they really don’t. Most Americans are what are referred to as “low information voters“, meaning that they aren’t keeping up with all the ins and outs of what’s going on in the political and policy world. And let’s face it, with the complexities and competing narratives surrounding politics, a lot of people are going to struggle to make sense of what’s going on even if they did paying attention. So what most people rely instead when forming their opinions are called heuristics, or rules of thumb, in evaluating the political sphere. One of the important heuristics which people use when deciding whether a president (or party, but mainly the president) is doing well or not is the presence of open conflict. If there’s open conflict, that sends a signal to voters that the president is not doing his job well. If there’s relative quiet and things are getting done – even if they are things that voters don’t necessarily agree with – that sends a signal to voters that the president is doing a good enough job. This is a well documented phenomena which has strongly influenced which party holds power in the legislative branch for the last 30 years. Typically, the conflict is created by the politicians from each party on capital hill. But given the Democrats’ demonstrable inability and unwillingness to provoke and sustain conflict, the work of creating conflict has fallen to the American people. While conservatives have been busy having a meltdown over the protests which basically amounts to screeching “shut up stupid women” over and over, this massive show of discontent and opposition sends a powerful signal to the average low information voter that there’s a problem. And when there’s a problem, it’s the president and his party which gets blamed. Of course, one protest isn’t going to change things, popular though narratives about “protests that changed the course of history” are. In order to bring about change, there needs to be sustained efforts, protests and confrontations which keep the conflict front and center in the public’s eye. At this point it seems likely that those of us who oppose Trump aren’t going to settle quietly back into normal life. The election of Trump has already radicalized a significant number of people. And Trump appears determined to do his part to keep the movement motivated and active. The problem we face is that Trump and the GOP are authoritarians who don’t much care what the public thinks or wants. And the GOP has managed to gerrymander and essentially cheat their way into a permanent grip on power. Which just makes it all the more important that we continue to engage in frequent, highly visible displays of opposition. While our opposition may not move Trump or lawmakers, the public has the expectation that the president will create peace, not turmoil. Really, there’s nothing that the average Joe blow wants less than a breakdown of social order and the ongoing presence of this conflict will send a powerful signal to them that the president is failing in his most basic tasks and duties. The danger of pursuing a course of action which maximizes conflict is that Trump’s authoritarian impulses will lead him and/or his supporters to respond with a show of force meant to shut down opposition. It is not beyond the realm of possibility that the kinds of state violence which we observed against Standing Rock water protectors will become common place throughout the country. However, a president who essentially goes to war against his own people will be signing his own resignation papers. Americans value peace and order (at least within our own borders), but at the very core of our identity is that we are a free people. We can be manipulated, but we’re damn hard to exert control over. No president who openly turns on masses of his own people will long endure. And when that president seems to be going out of his way to be as divisive and unpleasant as humanly possible, people are not likely to give him the benefit of the doubt. I mention the possibility of provoking a dangerous, repressive response because we need to be honest with ourselves about what we’re dealing with. However, I don’t think it will come to that. While it’s been criticized by the “give cheeto Mussolini a chance” brigade, the fact that there is such intense opposition right out the gate will work to our advantage so long as we maintain it going forward. Donald Trump is a thin skinned, vengeful billionaire who isn’t used to engaging in fights that he can’t just buy his way out of. He’s also a megalomaniac who has to bring his own cheering section with him where ever he goes. Either he’s going to start trying to placate us (getting rid of his appointees and advisers who have ties to white nationalists would be a great place to start). Or he’s going to continue to misstep badly. Either way works to our advantage. Never forget: both reality and the will of the American people are on our side. So protest away! It’s going to make all the difference. “A permanent grip on power”; much too pessimistic. Compare 2004 with 2008. (And look unflinchingly at the failures of nerve and misguided attempts at comporomise that led to it all being bogged down in 2010). Permanent is an overstatement, but unless there’s some radical reset, the GOP is going to be in power for the foreseeable future, no matter how unpopular they are with the American people. A big part of the problem is the gerrymandering and voter suppression that they’ve put into law. I don’t know it you’ve seen the video I linked to in reference to this problem, but it’s really quite astonishing to see what they’ve done. I forget the exact numbers, but just as an example of how bad it is, people cast millions more votes for Democrats in the house than for Republicans, but the Republicans have a strong majority. And that’s true not just at the federal level, but at the state and local level. Everywhere Republicans have power, they are acting to suppress voting. Hell, look what they did in North Carolina where they responded to the loss of the governor’s seat by sharply reducing the powers of the governor. That’s pretty scary to me. I mean, I’m sure the tide will turn in time, but I doubt it will be as fast as it could a decade ago. It may be a overstatement at this moment, but unfortunately, the potential exists for them to make it permanent because of the power that they have at this moment. Suppressing voting is only one example of what they can do at this moment. I’m glad that you brought up the authoritarian aspect of Trump and the GOP, which also makes it all the more likely that they could take measures to suppress the opposition and oppress dissent. If you commit to dissent and protest, then it’s truly necessary right now to know what you could be getting into and what you could be triggering for the future. Trump is just the kind of guy who would be quite happy with eliminating democratic processes and any opposition. If he reacts to sustained dissent and protest in that way, we could end up with a dictatorship and police state. The big question will be what will Congress do? Will the GOP go along with him in order to stay in power? Or will they honor democracy? I have thought about the danger of being too provocative. Our government already has a ridiculous amount of power. But I don’t think we can do anything other than resist. What I’m hoping is that these early, furious protests will have the same effect that Trump’s early outrageous behavior in his campaign did; set a baseline norm that’s hard to push back. Violence, it needs saying, would be counter-effective; I would not be surprised to see Trump’s goons trying to set it up. And insulting the followers, rather than the leaders, is likely counter-effective. Other than that, there should be no restraint and no respect. The tactic which I think is going to be most effective is to simply be ungovernable. We can actually learn a lot from Trump in this regard. If we create a million petty problems that drain government resources and attention, we make it harder for them to move forward. They’ll still make progress, but it should be like walking through water, fighting for each step, over and over and over. And I agree about ridicule. Trump’s so thin skinned that his reactions alone will reveal his true character and keep him distracted. What a mess we’ve got on our hands. I know a lot of people are putting their faith in our system of checks and balances, but the GOP doesn’t exactly inspire confidence in that regard. They hold as much power as they do because they’ve used gerrymandering and voter suppression to game the system as well as a steady diet of lies, scapegoating and fear mongering. What they did in North Carolina (moving to strip the office of the governor of much of its power) after a Democrat won the election was shocking. These people have not shown much commitment to democracy. To Paul Braterman, I made my comment not to be inhibited by fear but to go into resistance with eyes open to what the possible consequences are. Being informed and aware makes a huge difference in how strong one is in resisting, no? And by the way, I loved what the Dutch did and I agree with you about that.